The body of a child after a reported gas attack on Tuesday in the Syrian town of Khan Sheikhoun in Idlib Province. One of the worst chemical bombings in Syria turned a northern rebel-held area into a toxic kill zone on Tuesday, inciting international outrage over the ever-increasing government impunity shown in the country’s six-year war. Western leaders including President Trump blamed the Syrian government of President Bashar al-Assad and called on its patrons, Russia and Iran, to prevent a recurrence of what many described as a war crime. Dozens of people, including children, died — some writhing, choking, gasping or foaming at the mouth — after breathing in poison that possibly contained a nerve agent or other banned chemicals, according to witnesses, doctors and rescue workers. They said the toxic substance spread after warplanes dropped bombs in the early morning hours. Some rescue workers grew ill and collapsed from proximity to the dead. 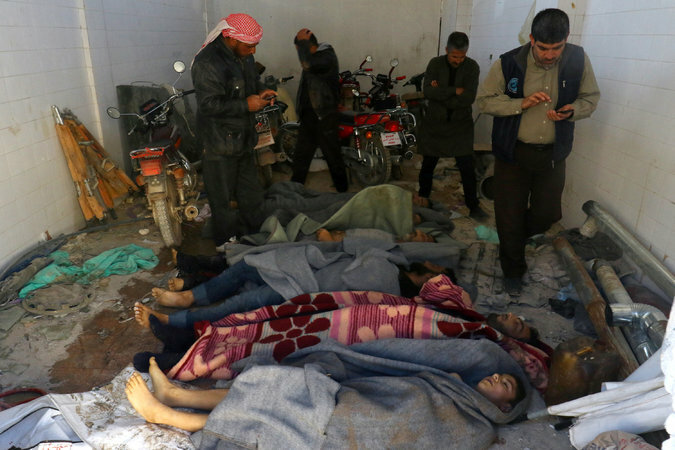 The opposition-run Health Department in Idlib Province, where the attack took place, said 69 people had died, providing a list of their names. The dead were still being identified, and some humanitarian groups said as many as 100 had died. The government of Mr. Assad, who renounced chemical weapons nearly five years ago after a large chemical attack that American intelligence agencies concluded was carried out by his forces, denied that his military had been responsible, as he has done every time chemical munitions have been used in Syria. Witnesses to the attack said it began before 7 a.m. 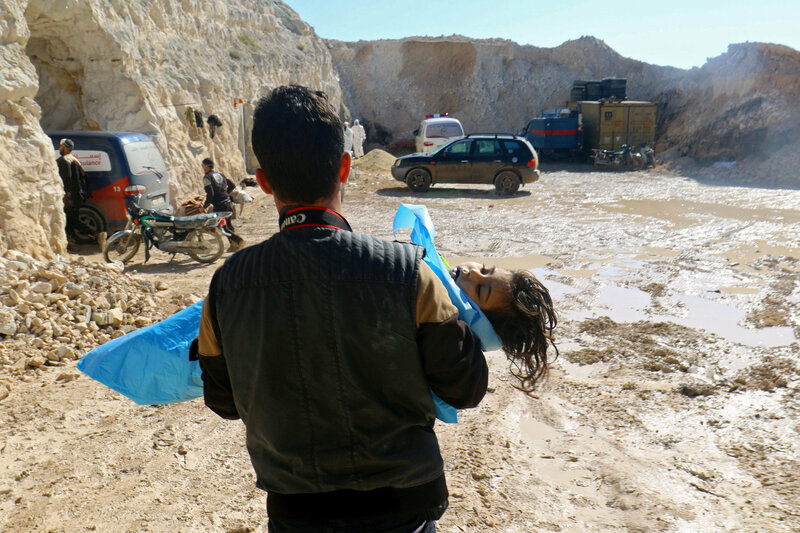 Numerous photographs and graphic videos posted online by activists and residents showed children and older adults gasping and struggling to breathe, or lying motionless in the mud as rescue workers ripped off victims’ clothes and hosed them down. The bodies of at least 10 children lay lined up on the ground or under a quilt. A few hours later, according to several witnesses, another airstrike hit one of the clinics treating victims, who had been sent to smaller hospitals and maternity wards because the area’s largest hospital was severely damaged by an airstrike two days earlier. The attack also seemed likely to dampen peace talks that have been overseen by the United Nations in Geneva and by Russia and Turkey in Astana, Kazakhstan. Incredulous over the chemical assault, humanitarian groups demanded action from the United Nations Security Council, where partisan divides over who is to blame for the Syrian war have paralyzed its members almost since the conflict began in 2011. On Tuesday night, Britain, France and the United States were pushing the Security Council to adopt a resolution that condemns the attack and orders the Syrian government to provide all flight logs, flight plans and names of commanders in charge of air operations, including those for Tuesday, to international investigators. The draft resolution, negotiated among diplomats from the three countries on Tuesday, was later circulated to all 15 members of the Council. It could come up for a vote as early as Wednesday. For Mr. Trump, who has repeatedly blamed what he has called President Barack Obama’s failures for the Syria crisis, the chemical weapons assault posed a potential policy dilemma and exposed some glaring contradictions in his own evolving positions on Syria. At the same time, Mr. Trump’s spokesman, Sean Spicer, denounced Mr. Obama for having failed to make good on his famous “red line” statement in 2012, suggesting he would intervene militarily in Syria if Mr. Assad used chemical weapons. Mr. Trump’s administration, which would like to shift the focus in Syria entirely to fighting the Islamic State, has in recent days described Mr. Assad’s hold on his office as a political reality — an assertion that has drawn strong condemnation from influential Republicans who say Mr. Assad must leave power. Russia has insisted that it had no military role in the strike. But a State Department official who briefed reporters in Washington said Russian officials were trying to evade their responsibility because Russia and Iran were guarantors of the Assad government’s commitment to adhere to a cease-fire in the peace talks that the Kremlin had helped organize in Astana. Rescue workers from the White Helmets civil defense organization said that many children were among the dead and wounded. Radi Saad, who writes incident reports for the group, said that volunteers had reached the site not knowing a chemical was present and that five of them had suffered from exposure to the substance. This time, people collapsed outdoors, and in much larger numbers. The symptoms were different: They included the pinpoint pupils of victims that characterize nerve agents and other banned poisons. One doctor posted a video of a patient’s eye, showing the pupil reduced to a dot. Several people were sickened simply by coming into contact with victims. The opposition minister of health, Mohamad Firas al-Jundi, said in a video that he had been in a field hospital at 7:30 a.m. when more than 100 people arrived wounded or sickened. Symptoms included suffocation; fluid in the lungs, with foam coming from the mouth; unconsciousness; spasms; and paralysis, he said. A 14-year-old resident of the attacked town, Mariam Abu Khalil, said she had left home for her examination on the Quran — scheduled for early morning because fewer bombings were expected then — when the attack took place. On the way, she saw an aircraft drop a bomb on a one-story building a few dozen yards away. In a telephone interview Tuesday night, she described an explosion like a yellow mushroom cloud that stung her eyes. “It was like a winter fog,” she said. Sheltering in her home nearby, she saw several residents arrive by car to help the wounded. “When they got out, they inhaled the gas and died,” she said. The attack appeared to be the deadliest chemical attack in Syria since the August 2013 assault. Under threat of United States retaliation, Mr. Assad agreed to a Russian-American deal to eliminate his country’s chemical weapons program, which until that time it had denied having, and to join an international treaty banning chemical weapons. But the operation took far longer than expected and raised questions about whether all the materials were accounted for. The head of the international monitoring body, the Organization for the Prohibition of Chemical Weapons, complained in an internal report about misleading statements from Damascus and expressed concern about possible undeclared chemical weapons. 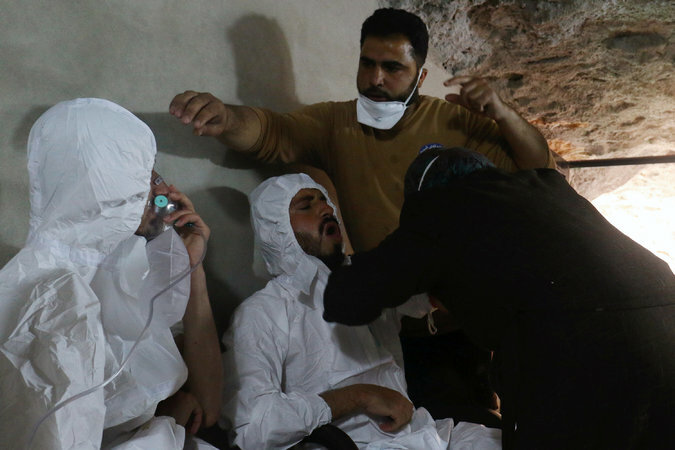 Since then, the organization, working with the United Nations, has found that the Syrian government used chlorine gas as a weapon three times in 2014 and 2015, violating the treaty. Rebel fighters, doctors and antigovernment activists say there have been numerous other chlorine attacks, including at least two in the past week, in one case killing a doctor as he worked. The Organization for the Prohibition of Chemical Weapons has also accused the Islamic State of using banned mustard gas in Iraq and Syria. The area around Khan Sheikhoun is not held by the Islamic State, but by other insurgents: Qaeda-linked militants and a variety of other rebel groups. A chemical weapons attack, if carried out by the government, would be a brazen statement of impunity, coming during a major international meeting in Brussels where officials are debating whether the European Union and other countries will contribute billions of dollars for reconstructing Syria if it is presided over by a government run by Mr. Assad.